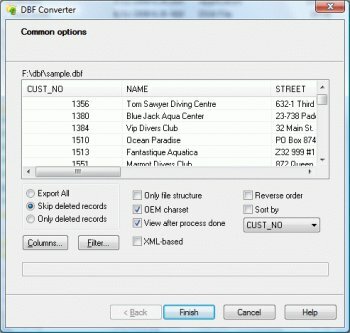 DBF Converter is a versatile yet easy-to-use conversion program. It has a familiar Wizard-like interface but can also be used as a command-line utility for batch file processing. It supports all the modern data interchange formats, such as XML, CSV, TXT, HTML, RTF, PRG and others. You can even convert your DBF table into a set of SQL queries that can be imported into any SQL database.